Gary started climbing in 2010 when he lived in Anacortes, WA while stationed there in the Navy. His roommate talked him into bouldering on Mt. Erie. After getting hooked, Gary left the country for a 7 month deployment in the Middle East. To fill the void of not actually climbing, Gary read books, forums, watched videos, practiced knots and rescue from the top of his bunk to fill the void of not being able to actually climb. This turned out to be a great way to build a solid and knowledgeable foundation of skills. He also ordered a lot of gear to be sent home. When he finished deployment, there was a giant stack of climbing gear waiting to be used. This is when things got serious. This was Gary’s last few months in the Navy, and his first summer in WA. He enjoyed learning outdoor rock climbing at Mt. Erie, and soon hooked up with fellow AAI Guide Lee Lazzara for some outings. After his enlistment in the Navy, Gary moved to Durango, CO for sunny weather and to pursue his new found love for rock climbing. This is also where he met another soon-to-be AAI Guide, Nik Mirhashemi. Nik and Gary started climbing together exclusively. Gary became interested in guiding and became an AMGA Certified Single Pitch Instructor in 2013 and thus kicked off his guiding career. Gary started guiding for Kling Mountain Guides in Durango, and continued to progress as a mountain guide with training thru the AMGA. He has traveled all around the west, and is in love with the sandstone climbing in the Moab and Red Rock areas. 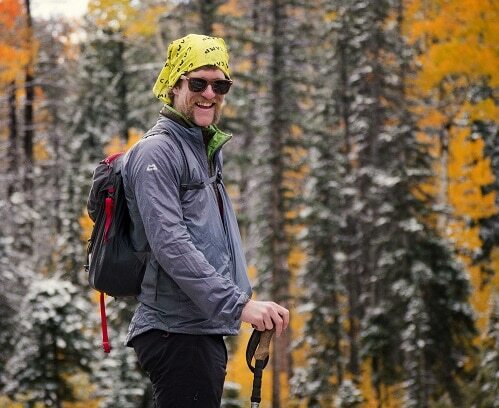 Gary continued to work based out of Durango for 4 years, until bigger terrain and more interest in alpine, ice, and mountaineering objectives brought him to the Pacific Northwest and Alpine Ascents International. Guiding in the PNW is a pivotal step in a guides’ career and Gary is excited to continue pursuing IFMGA Guide status and explore new terrain! While the equipment and other necessities such as food were extremely important vehicles for success/ the overall experience on this expedition and definitely contributed to the overall quality, what really made this trip shine were the guides.